The equity markets shot higher last week. The S&P 500 rose 1.8%. The Dow Jones Industrial Average added 1.4%. And, the star was the tech-heavy Nasdaq Composite, climbing 3.3% on the back of better-than-expected earnings from a couple large-cap tech companies. 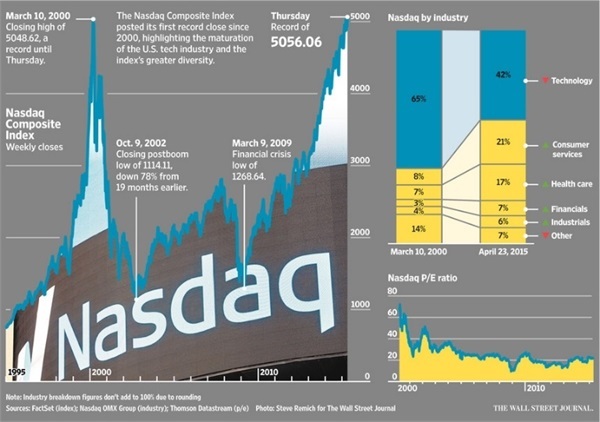 On Thursday, the Nasdaq crossed its previous high of 5,048.62 set in March 2000, more than fifteen years ago. However, the composition is markedly different today. At the last peak, the Nasdaq traded at 175x trailing earnings. While the index today is still very technology and biotechnology heavy, it trades at 30x, not cheap, but also not eye-poppingly expensive like before. It is also worth keeping in mind that its price is still approximately 35% below its previous peak when adjusting for inflation. Early last week, the housing market looked solidly on the mend when sales of existing homes rose to an 18-month high, increasing 6% to a seasonally-adjusted annual rate of 5.19 million homes. This represents growth of 10% year-over-year. Previously owned homes account for more than 90% of all transactions. Later in the week, statistics about new home sales were released and they were more impressive. For the month of March, sales of newly built homes grew 19% year-over-year to a seasonally adjusted 481,000 homes, according to the Commerce Department. While impressive, the market for new home construction still has a lot of ground to recover. The seasonally-adjusted pace for March is still just two-thirds of the annual average since 2000. Continued momentum for new home construction has a positive influence on the overall economy, since it typically makes up approximately 5% of GDP. Just six weeks into the European Central Bank’s quantitative easing program, more than half of European sovereign debt offers a negative yield – investors are essentially paying for European governments to hold their cash. The bond world has turned upside down quickly. 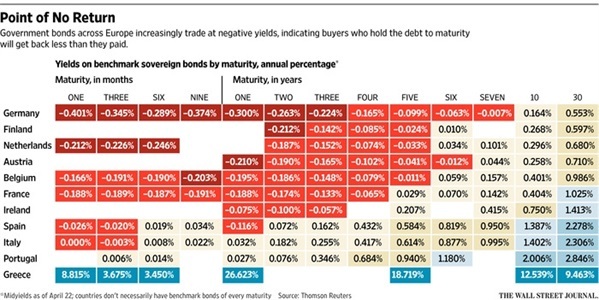 Just a year ago, negative yields didn’t exist but this all changed rapidly last June when the ECB but pushed its deposit rate into negative territory and began hinting about an upcoming bond purchase program. By the time the bond purchases were officially announced in February, the prices on some 40% of the €5 trillion European sovereign debt market moved above par. Many expect yields to continue moving lower in the near term. Recent investor nervousness over the potential of Greece defaulting has caused large inflows of money into relatively safe German bonds. The yield on the German 10-year currently stands at 0.16%, and some experts think it’s only a matter of time before this moves negative too. Longer term, bond gurus are getting nervous. Bill Gross of Janus recently called the German 10-year a “short of a lifetime,” although he said he can’t be certain on the timing. Psychologists have long known that personality traits affect health. People with high levels of conscientiousness typically live longer, largely due to healthier diets. They also tend to have organized desks. What is less known is if the opposite is true. Can working in a neat or cluttered environment affect your behavior? Researchers at the University of Minnesota conducted some experiments that suggest it can. In a study, they randomly assigned groups of people to spend time in one of two office spaces, one that was tidy or one that was messy. When exiting after ten minutes participants were offered the choice of an apple or chocolate bar. Interestingly, the students who sat in the orderly office were twice as likely to choose the healthier snack as those who sat in clutter. Now that my desk is organized, I wonder what my messy email inbox says about me?